There are nine foundational lifting movements listed on the whiteboard. They consist of three of each of the following types of movements: squats, presses overhead and lifts from the ground. They are foundational in the idea that they are building blocks for the rest of what we do in our strength and conditioning program. Work on performing these movements efficiently and you will improve in all areas of CrossFit. Keep the bar resting on your shoulders, not your hands. This is the rack position. 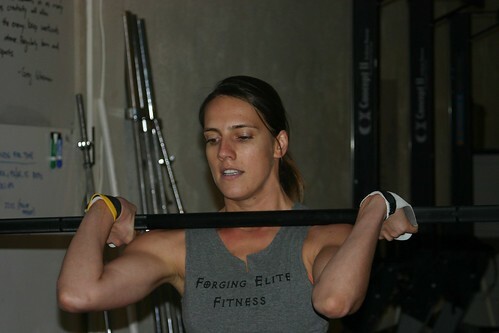 Keep your knees out, chest up and lumbar extended, if you cannot maintain, dump the bar safely in front of you. Keep your head looking straight ahead or slightly up is ok. If you have trouble with any of these criteria, make a note and work on them before or after your future workouts. This is the foundational movement to performing a full clean!